There's also a list of formerly-listed tunes and new tunes (the former having been played less often during the past 18 months or so; the list shows the years they were included). 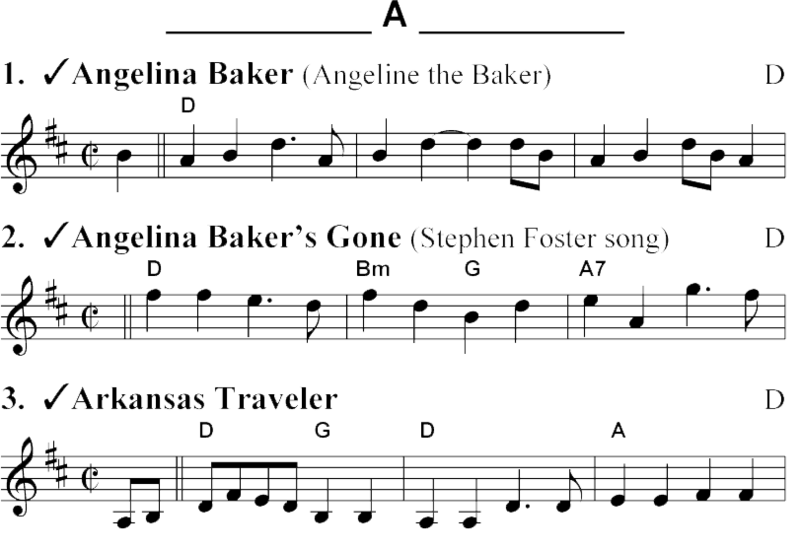 The “tune starter” list has some 275 tunes with title, key(s) and mode(s), and 3-4 measures of the first part of the tune, in standard notation. These are also mostly old-time in style. In a few cases I've also added the first few measures of succeeding parts (new parts are introduced by ‘||’), for tunes where some of us have had trouble remembering which 'B' goes with which 'A', or which version of a tune is meant. I hope these will help those of us who know many of the tunes, but can’t always remember which is which, or how they start. The The Printable Tune-Starter List, Alphabetical * is in 3-column format, intended for printing on letter-sized (8.5 x 11 inch) paper; currently 6 pages. The Small-Screen Tune-Starter List * is in single-column format, intended for display on a phone or other smallish screen; alphabetical only. Use a PDF viewer that can search for parts of the titles. * Updated 8/10/2014, with many errors corrected; minor update 8/24/2014. Please send me any suggestions or corrections for any of these lists. Need more information? Email Pete: jaminfo2, at showman dot org, with subject: "Old-time jam query," or call (408) 255-0297. To reduce spam, email addresses on these pages are not clickable; you need to type them in. Sorry for the inconvenience.